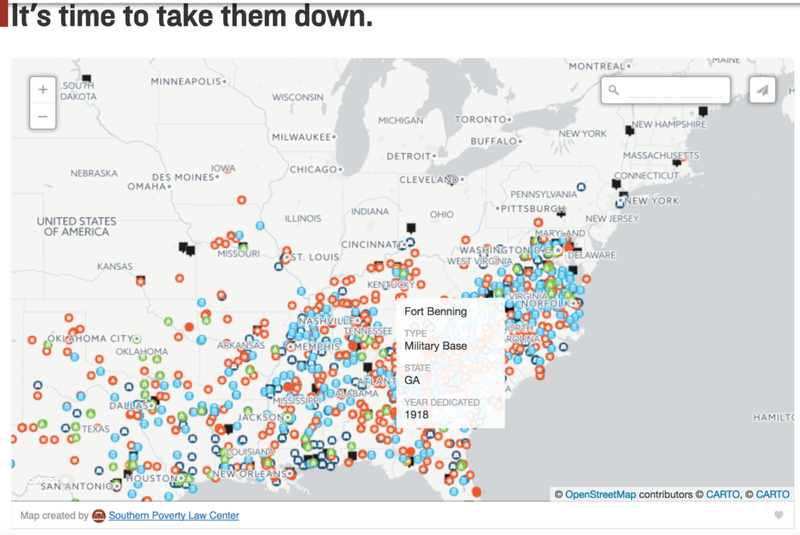 The Southern Poverty Law Center has declared three of America’s largest Army bases Confederate monuments “with the potential to unleash more turmoil and bloodshed” if activists don’t “take down” the Army bases. The SPLC included Fort Hood in Texas, Fort Bragg in North Carolina and Fort Benning in Georgia on a list of 1,500 “Confederate monuments” that the SPLC claims could inspire more violence like what happened in Charlottesville, Virginia last month. All three bases are named after Confederate military leaders. The list makes no mention of renaming namesakes of Confederate monuments; taking the monuments down is presented as the only option. The recent leftist campaign against Confederate namesakes and monuments has included a willingness among some far-left actors to destroy government property to accomplish their goals. The SPLC is urging leftists around the country to flood their local newspapers with letters to the editor urging the removal of the monuments, although the group’s campaign against the army bases could serve as a dogwhistle for left-wing militants willing to take extreme measures to take down Confederate monuments. 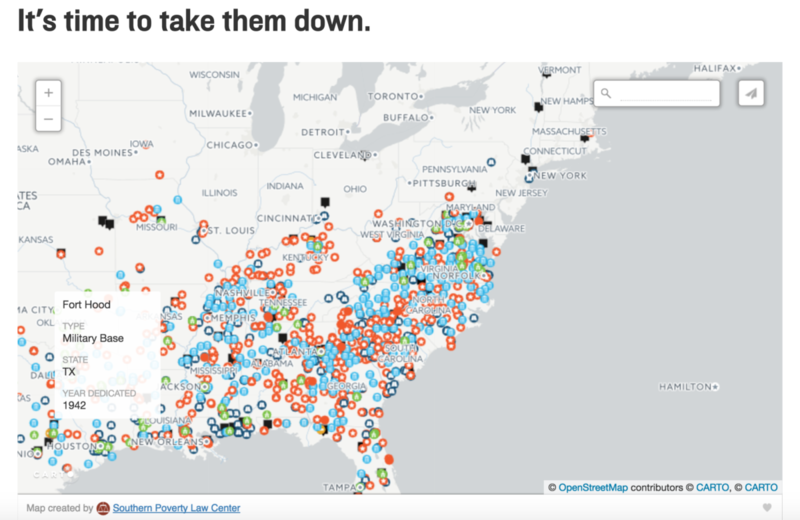 The SPLC’s map of “Confederate monuments” resembles the group’s “hate map” that has repeatedly smeared conservative organizations as “hate groups” and inspired domestic terrorist Floyd Lee Corkins II to shoot up the Family Research Center in 2012. At the same time that the SPLC is waging its campaign against Fort Hood, approximately 400 American soldiers stationed at the base are down in Houston helping victims of Hurricane Harvey. Aaron Lopez was a leading contributor who helped build the Touro Synagogue, and he was given the honor of laying one of its cornerstones. Aaron Lopez was involved in the slave trade. While The Secret Relationship Between Blacks and Jews describes Lopez as “Newport’s leading participant in the Black Holocaust”, historian Eli Faber determined Lopez underwrote 21 slave ships during a period in which Newport sent a total of 347 slave ships to Africa, and Faber described Lopez’s ventures in the slave trade as “an infinitesimal part” of the British slave trade.Then in 1946, Touro Synagogue was designated a National Historic Site. The Friends of Touro Synagogue (now the Touro Synagogue Foundation) was established two years later to aid in the maintenance and upkeep of the buildings and grounds as well as to raise funds for and to publicize the history of the Touro Synagogue. Who needs to be put out of business is the SPLC crooks that stash millions of dollars of their donations in offshore banks. I have heard of these crooks for years they could never get to much attention until now so I guess the left has decided to adopt these bastards. I know one thing that will not fly is anyone even thinking about attacking the army bases anywhere they will get their asses shot off. Any attack on a military base in the US or another country would be a terrorist attack. So if Antifa should be the group you can count on any one of them that is armed an takes one shot at an army base they will be carried off in a body bag. Another thing that needs to be done is for the state or town that has had their monuments destroyed needs to file a class action suit against SPLC for being the instigator of the destruction. That may be the only way to put a stop to these greedy crooks.